Urnatur is located in the woods outside Ödeshög in Östergötland, in the middle of southern Sweden, about 6o km from Jönköping in the south and Linköping in the north. It takes 2-3 hours to drive by car from Gothenburg, Stockholm or Malmö. The bus is the best way to get to Ödeshög with public transport. From the bus stop it is about 6 km to Urnatur. It is possible to walk (if you have a backpack) or take a taxi. We are also happy to pick you up if manageable. Driving in from the E4 highway towards Ödeshög you run halfway through the village (past the church and then a further 300m). Then turn left towards Tranås, follow Tranås road about 2-3 km. Turn left at the sign Visjö / Sjögetorp. Follow the road until it forks and run straight forward on the gravel road to “Sjögetorp”. Follow this small road 1.5 km. When you see an unpainted house with blue windows, you have arrived. Other close airports (2-3 hours): Stockholm Arlanda Airport, Stockholm Skavsta, Gothenburg Landvetter. The route is easy to walk. Starts in the parking lot at Kråkeryds Reserve at lake Vättern. Follow the road east, after a few hundred yards you will come to a crossroads. After that, follow a simple dirt road through the tunnel under the E4. 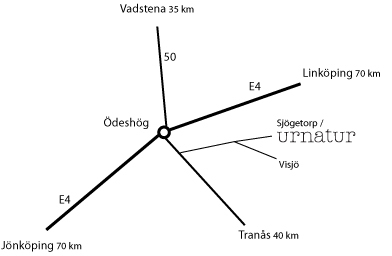 The landscape is pastures, and you can make a detour to Visjön, visit Urnaturs facility with tree house and shop with crafts. At Sjögetorp is a ullspinneri. It continues up towards Månsabola where the trail forks. The main trail follows the gravel road as an alternative point pass some of the cottages in the area. The gravel road going up to Bonderydssjön where there are beavers. The gravel road goes over the forest road and the trail continues up to Gran lake and a shelter that is beautiful. There are also privyand bathing. The trail then continues until Trehörna between homestead and church. The route is rich in historical sites and natural values. The trail follows the beautiful trails and simple paths along Vättern until Stocklycke. On your way you will pass through the Great Lund naturreserve. The trail then passes Hästholmen where you can visit the port. Then the trail continues past the Ellen Key villa Strand. There you can get a guided tour. You can make a small detour to Alvastra convent ruins, Swedens eldest monastery, then you continue up to Omberg mountain. The route ends at Omberg where you also can continue your walk Östgötaleden around Omberg. (Maps available at Stocklycke hostel).